Featuring the perfect balance of multi-purpose tools, the Exclusive Blue Leatherman Raptor performs with excellence and efficiency in any emergency situation, allowing uniformed professionals to quickly and accurately do their jobs. This powerful set of 420 HC Stainless Steel Folding Medical Shears is designed to help you get the job done as quickly and safely as possible, without an overabundance of extra, unnecessary tools that could complicate potentially life-threatening situations. 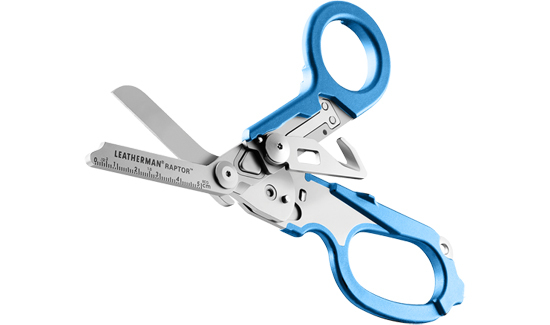 Created with the expertise of special-operations medics, EMTs, and fire professionals, its folding medical shears have serrations capable of gripping materials, thereby allowing a powerful, fast cut. When not in use, they can be taken apart for cleaning and routine maintenance. Also included is a strap cutter with a locking safety liner, which can easily be deployed with one hand, even while wearing aviator-style gloves. It can be used when the shears are open or closed. Integrated into its strap cutter, the oxygen-tank wrench can be used to access life-saving oxygen in the absence of an oxygen tank’s wrench. The Raptor’s ring cutter is excellent for use on most standard gold bands – an essential tool for first responders to have in their arsenals. When not being used, the Raptor can be securely stowed in a MOLLE-compatible, injection-molded, polymer holster, which can rotate on a sturdy clip to enable quick access on a vest or pack. 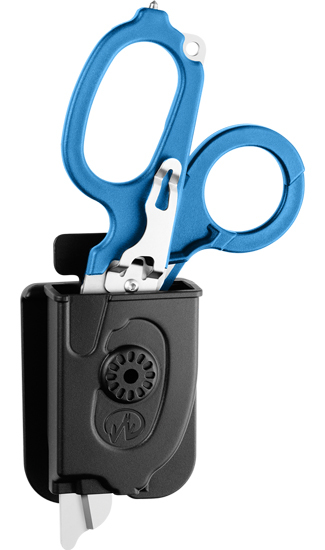 It can conveniently be stored in its holster with the shears in the open or closed positions. For more information and to get yours, be sure to visit OfficerStore.com.